CoroCoro Comics is known for its coverage of the Pocket Monsters movies. Every year the magazine is used as kind of the centerpiece of the films' coverage with news getting announced there first and then making its way to other media outlets from there. Since I live in Japan I have access to bookstores that sell old issues of CoroCoro Comics. They're hard to find but every now and then you'll get lucky enough to come across a Mandarake or a Book-Off store that has an old issue of CoroCoro Comics from the 90s. I've managed to find a few of these precious time capsules from the late 1997 / early 1998 period and so today I thought we'd take a look at what one of the biggest publicity machines this franchise has was doing to promote Mewtwo Strikes Back. Unfortunately I do not own every issue released at the time so there will be some gaps in the coverage here. I'll try to fill those in once I'm able to get my hands on those issues of CoroCoro. 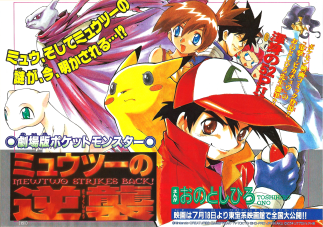 The December 1997 issue of CoroCoro Comics, which would have gone on sale on November 15th, had a two page spread about the upcoming movie. It seems like Mewtwo, who hasn't appeared in the TV series yet, will show up in this movie. Let's all look forward to the kind of battle it'll have with Pikachu!! Image Caption: Will Mewtwo make Pikachu suffer with attacks like Psychokinesis, just like in the games? 2. What pokemon will appear? It seems that the number of pokemon who are going to appear in the movie is greater than what's be on the TV show so far. Will we also be able to see the "mythical Mew" from the TV special? Image Caption: Since Mewtwo is appearing then that means the chances of Mew also showing up are high. It seems like a second Pokemon movie is being made! The title and other information like that hasn't been decided yet but it seems like we'll get a spectacular double feature! Image Caption: Since the movie's coming out in summer maybe this is what Pikachu will be doing? Those of you who can't wait until next summer should head over to the Nintendo Space World! There will be a world premiere trailer for the movie playing at the event! Image Caption: Nintendo Space World will take place on November 22nd and 23rd at the Makuhari Messe. The "TV special" they mention in the second bullet point there seems to be in reference to a special that aired on October 7th, 1997 (秋のスペシャル). The special was a recap of the first 27 episodes and also apparently featured footage of Mew at some point. There's a Yahoo! Auction for the script for this special that is, at the time of this writing, running at about US $1,600. I have no idea what the trailer that was shown at the Nintendo Space World event was. Could it have been that weird trailer featuring an older Kasumi, minus the disclaimer at the end saying the movie doesn't have any scenes of extreme flashing since this would have been shown before the Pokemon Shock incident? I've tried to look it up but so far haven't come up with anything. Notice how the article doesn't have any screenshots or even an official movie logo. It was common for CoroCoro to have its own artists provide the artwork to accompany their articles in lieu of screenshots at the time and this article is just another example of that. At this point it seems like Mew's involvement in the movie had yet to be officially announced though it is being heavily implied. It also looks like the Pikachu short wasn't given a title yet. 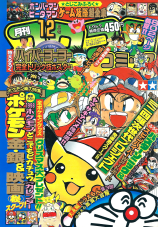 The April 1998 issue of CoroCoro Comics went on sale March 15th, 1998. There really isn't much of anything here. We just find out that the movie pre-order tickets go on sale March 20th and that the first 30,000 people to get a ticket will also receive a set of commemorative pokemon postage stamps. That massive block of text in the yellow box there is merely a list of stores that are selling the pre-order tickets so I'm not going to bother translating that. You would think the pre-order bonus for this movie would be getting a Mew for your Red / Green / Blue games but there was actually already a Mew giveaway earlier in 1997 completely unrelated to this movie. I'm also sure the logistics of having kids line up with the Game Boys and connecting their machines to a transfer cable, one by one, was too much of a headache for them to bother with and so they decided to give out postage stamps instead. It also shows that the title and the logo for the Pikachu short had already been revealed by this point. So I'm guessing that was announced from January - March 1998? The coverage seems pretty light but you have to remember that the show was still on its hiatus at this point. 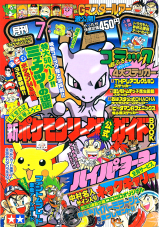 The July 1998 issue of CoroCoro Comics went on sale June 15th, 1998. This issue reveals a few scoops about the upcoming film. Scoop 1 "New Pokemon will show up in both Pikachu's Summer Vacation and Mewtwo Strikes Back!! This new pokemon has a slightly angry face! This cute, round new pokemon is Buru*! Donphan, who may appear in the new Game Boy games Pokemon Gold / Silver, shows up in Mewtwo Strikes Back. Togepi's seen crying in the trailer for the film. Does this have anything to do with the two new pokemon? CoroCoro Comics pulls a 4Kids and mixes up their pokemon names! That's right, the author of this piece misidentifies Marril as Bull and Bull as Marril! Bull's name is written in Japanese as ブルー, and while we all know that this is meant to be written out in English letters as "Bull" it's also possible to interpret that as "Blue." And, well, since Marril is a blue pokemon then whoever wrote this piece for CoroCoro probably just assumed that the blue pokemon is named "Blue" and went with that. Still, it's pretty sloppy journalism and is the sort of mistake they'd absolutely get hammered for if it happened today. Also, "Donphan, who may appear in the new Game Boys games" is such a weird sentence for them to write considering how Donphan had been hyped up as one of the new Gold & Silver pokemon for quite a while by that point. "Pokemon" flies through the sky on top of everyone's dreams! To commemorate the release of the movie, new ANA Pokemon jets (B-747 and B-767) sporting pokemon designs on them will fly domestically this summer! We definitely want to ride one! Image Caption (top): This picture was created by the editing department. The final design may change. Image Caption (middle): Here's what the left side of the B-747 looks like! Image Caption (bottom): And this is the right side. The design's different from the other side! The history of the ANA Pokemon jets is a topic for another article but it's interesting to see how it all started from Mewtwo Strikes Back. A special movie limited edition version "Pokemon Stamp Pin" is coming out! The "PokeSta" extras that come with the elementary school magazines like Shougaku Ichi-Nensei have been made into pins! A special movie limited edition Pikachu and Mewtwo versions will come out! The price and release date have yet to be decided. We're getting read for the "Pokemon Stamp Rally"
It's been announced that the "Pokemon Stamp Rally" that was such a big hit last year will be coming back to commemorate the release of the movie! The plan is for it to take place in Tokyo, Osaka, and Sendai. The website misoの末裔 has scans of the flyer for the actual stamp rally (the one shown above is a picture of the poster from the previous year's rally) and is worth checking out. A "Togepi" MonColle Keychain will be given out to 100 readers! The Togepi MonColle is being made into a special keychain and will be given out to 100 of CoroCoro's readers! Please put your address, name, phone number, and what grade you are in school on a postcard and send it to the address over on the left. We will draw 100 names and give those people one of the special keychains. This will have a keychain attached to it exclusively for CoroCoro! Entries must be postmarked by July 14th. 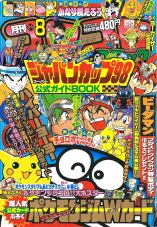 Winners will be announced in the September issue of CoroCoro Comics. This issue also contains the 52-page manga adaptation of the film created by Ono Toshihiro. You can read more about this manga adaptation over in the Manga Guide. 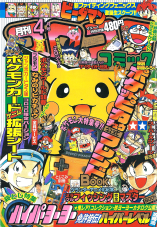 The August 1998 issue of CoroCoro Comics went on sale July 15th, 1998. This pokemon's defining characteristic is its rolly-polly marine blue body. Image Caption (top): Marril gets over-excited and is sent flying! Image Caption (bottom): It's having a water race with Zenigame!? It's a pokemon who looks like a bulldog (?)! Image Caption (top): Bull's pulling on a rope with Pikachu. Image Caption (bottom): Bull's sent flying just like Marril. What's going on here? Bull and Marril appear in Pikachu's Summer Vacation and Donphan appears in Mewtwo Strikes Back!! Image Caption: Check out how it seems like it has a lot of power and a strong body!! Well, they managed to get Bull's and Marril's names right but it seems like the writers still didn't actually bother to do any more research beyond that. I love how they're just like "I guess Bull's based on a bulldog, maybe?" Come on now. The ANA Pokemon Jet takes off into the skies! Here's the first look at the inside of the ANA Pokemon Jet that's currently flying around Japan to commemorate the release of the movie! You should give it a try! Image Caption (Top): The flying Pikachu's on the tail fin! Image Caption (Upper Right): Mewtwo and Mew are in the middle! Image Caption (Bottom Right): The complimentary on-board drinks come in this Pokemon cup! Image Caption (Upper Left): There's a different set of pictures on the right side of the plane! Image Caption (Bottom Left): The seat covers are decorated too! You can also get these at the theater! Pokemon Merchandise Catalog! Here's a look at the limited edition merchandise and Togepi merchandise being sold in theaters and toy shops! There are figures and stuffed animals that are faithful 3D recreations of Togepi!! There's a fun poster you can hang up in your room and a fan that'll really come in handy this summer! Image Caption: There are three types of these B2 posters in total and they're 500 yen each. The fan has different images on the front and back and costs 500 yen. These telephone cards have cute images on them! Image Caption: It's a waste to use up (?) these 50-time use telephone cards. There are five types altogether and are 800 yen each. They're ball pens with Pokemon figures attached to them! Image Caption: There are three types: one with Pikachu, one with Togepi, and one with Mew. They're 500 yen each. It's a special limited edition pin that you can only buy at the movie theater! They're not even trying to hide the fact that this is an advertisement, are they? It's hard to imagine the modern-day CoroCoro Comics being this brazen. There were also ads scattered throughout the issue for movie-related merchandise. On the left there is an ad for a new series of Carddass cards that will feature "the newest information from both the TV series and the movie!" The ad in the middle is for "Pokemon Craft Movie Special," a set of special paper dolls you can make "without scissors or glue." The ad on the right is for the seventh and eighth Pokemon CD releases, "Can You Play All the Pokemon Songs?" and "Pika Pika-massai-chu." The latter is a CD that contains both the opening and ending themes to Pikachu's Summer Vacation. And that's all I've got! I'll be sure to add more information as I acquire more vintage issues of CoroCoro Comics.